Check out Lake Whitney if you are looking for lake homes for sale. Situated near the Dallas–Fort Worth Metroplex, Lake Whitney has been called the “Getaway Capital of Texas” by the state’s legislature because of the pristine scenery it preserves and the bounty of recreation opportunities it affords. Lake Whitney is fed by the Brazos River and helps to compose the Texas Lakes Trail Region of the state. The lake’s 225 miles of immaculate shoreline twists, turns ...Learn more here! Hummingbird Hideaway on 11 Acres! Check out Lake Whitney if you’re looking for lake homes for sale. Situated near the Dallas–Fort Worth Metroplex, Lake Whitney has been called the “Getaway Capital of Texas” by the state’s legislature because of the pristine scenery it preserves and the bounty of recreation opportunities it affords. Lake Whitney is fed by the Brazos River and helps to compose the Texas Lakes Trail Region of the state. The lake’s 225 miles of immaculate shoreline twists, turns, and winds around, making it an ideal destination for numerous recreation activities. Lake Whitney’s intricate topography contributes to its status as a prized fishing lake, as well. Massive limestone bluffs shoot up around the edge, while the lake bottom’s uneven surface serves as great grounds for feeding and spawning. You’ll come across giant blue catfish, white crappie, and channel and flathead catfish, along with white bass, striped bass, and largemouth and smallmouth bass. With so many varieties of fish to stalk and conquer, Lake Whitney is proud to host several tournaments throughout the year. When you think of Lake Whitney, think of endless possibilities. Pontoon boating, kayaking, power boating, water skiing, sailing, and canoeing all provide adventure on the water. Several marinas are situated around the lake for your convenience. Feel free to stop by any of the marinas to rent a watercraft, stock up on bait, buy fuel, or even dock your boat. Enjoying your day on the lake is made even easier knowing lake homes for sale have access to all these features. More than twelve parks surround lakefront properties on Lake Whitney, each offering its own recreation accommodations. Lake Whitney State Park occupies 995 acres of land along the water. Here you’ll find premium picnic and camping spots, in addition to cycling, nature, and horseback riding trails. American Bald Eagles pass through the area often, so don't forget to bring your binoculars for spectacular bird watching opportunities. Golf enthusiasts can play at a number of fine local courses. White Bluff features two notable courses designed by Bruce Lietzke. The “Old Course” showcases stunning views of the lake, and the “New Course” pits you against some formidable water hazards. If you’d like to live on a Lake Whitney golf course, visit GolfHomes.com for property listings and details. Even the night sky belongs to you at Lake Whitney. You can participate in a “star party” and learn all you want to know about astronomy from the experts. 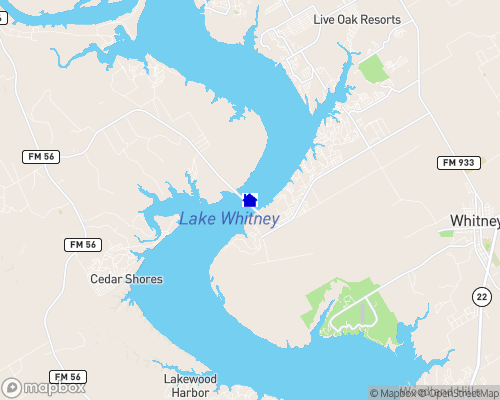 Lake Whitney is located in central Texas on State Highway 22 about 40 miles northwest of Waco & about 90 miles south-southwest of the D/FW Metroplex, with Hill County on the east and Bosque County on the west. Lake Whitney offers some of the best outdoor recreation in Texas. Whether you are looking for a day of relaxation, a weekend getaway, or an "out of the mainstream" vacation spot, Whitney Lake is the place. The clear water, scenic bluffs, a relatively mild climate, and excellent fishing, swimming, and boating opportunities attract approximately two million visitors each year. Whitney has great camping, picnicking, day use, and group facilities available. There are 10 Corps of Engineers parks, one state park, and four additional parks managed by Hill County or private individuals. The 23,560-acre Corps of Engineers impoundment on the Brazos River, is one of the most popular water attraction areas in the nation. Attendance figures show more than four million visitors annually, but there is ample room on the lake that stretches 45 miles up the Brazos River Valley. Scores of campsites, marinas, parks, recreation areas, and leisure home developments along the shore. Fishing is excellent in innumerable coves and inlets. Towering cliffs often edge the clear blue waters, and scuba divers explore depths that range to nearly 100 feet. A few miles west of Whitney via FM 1244 or FM 1713; also accessible from Clifton, Meridian and Hillsboro. Lake Whitney is one of the prettiest lakes in Texas. This, combined with excellent public access and good fishing for many species, makes it a popular destination. It offers top-notch angling for striped bass and white bass, along with unique and diverse opportunities for smallmouth bass and trophy blue catfish. Texas anglers who have not fished Whitney are missing out on a great experience. FISHING COVER/STRUCTURE The long winding lake offers a variety of shoreline cover from gently sloping blackland banks with abundant cedar and hardwood timber, to majestic limestone bluffs and rock points. FISHING TIPS AND TACTICS Lake Whitney provides some of the best striped bass fishing in the state, with March through May being the best months. Bank anglers are most successful fishing below sand or gravel bars on the Nolan and Brazos Rivers above the reservoir. In the main lake, anglers fish on windswept sandy beaches using shad or inland silverside ("ghost minnows") for bait. Boat anglers find stripers in the open reservoir feeding on large schools of shad or near submerged brush or timber. Topwater lures, jugs, and live bait are all effective at this time of year. From June through September, the lake is stratified, with little oxygen and cooler temperatures below 20 to 30 feet. Stripers seek out the coolest water they can find with tolerable oxygen levels. Trolling or drift fishing using large diving baits, jigs, or live bait may catch these suspended fish. Most summer catches are made in the middle and lower portions of the reservoir. In October and November, stripers inhabit all depths. They are frequently found along river channels in deep water, and occasionally feeding at the surface. From December through March, troll river and creek channels using large jigs and other artificial baits. Many wintertime catches are made fishing off the bottom with live bait, slabs, or jigs. White bass migrate up the Brazos and Nolan rivers to spawn from March through May. Best catches are made below sand and gravel bars and along sandy shorelines. Anglers use a wide variety of baits including minnows, jigs, slabs, and spoons. White bass fishing is productive in the main reservoir from April through November. Concentrations are most commonly found near sandy beaches, on roadbeds, and near submerged timber in shallow water. Large schools frequently surface in open water while feeding on schools of shad. Anglers can find them by using sonar or observing gulls that feed on shad. Most activity occurs in early morning and late afternoon. Tail spinners, spoons, and small jigs are good bait choices. Spring is the best time to catch quality size largemouth bass. From March through May, fish are in shallow water 2 to 15 feet deep. At this time of year, bass are caught along shorelines and in coves on spinner baits, topwater baits, plastic worms, and crank baits. Anglers are most successful in areas with flooded terrestrial vegetation, submerged brush or logs, or inundated willows. From June through August, largemouths are usually found at depths of 10 to 20 feet in the clearest parts of the reservoir. However, some may remain at shallow depths during the day in the murky "off-colored" water. Productive baits include plastic worms and deep-diving crank baits. In September and October, bass may be caught near the surface or in water less than 10 feet deep. From December through February, anglers should concentrate on depths of 15 to 30 feet, using plastic worms, jigs, and deep-diving crank baits. Smallmouth bass fishing can be excellent, especially in the middle and lower portions of the reservoir where the water is clearer and rocky habitat predominates. From early March through May, smallmouths concentrate in rocky coves and the backs of creeks. From June through August, they remain in or near deep water and night fishing is best. Fishing heats up as the water cools from October through December. Medium-sized crawfish-colored crank baits, sassy shad, and Carolina rigs seem to produce the best results. Crappie fishing is best during the March-April spawning period when fish are concentrated in water 3 to 15 feet deep near submerged brush and timber. From May through September, crappie are commonly caught near submerged timber, bridge pylons, or submerged boulders in water exceeding 10 feet in depth. The middle and upper ends of the reservoir are best. Medium-sized minnows and small marabou or tube jigs are good choices. Blue, channel, and flathead catfish are all present in Lake Whitney. All three species can be caught year-round, but fishing is best from April through June, when catfish are spawning. Most spawning occurs in shallow coves or along cut banks in submerged timber or sparse, large rock, with adjacent deep water. Channels and blues can be caught in warmer weather by drift fishing across shallow main lake flats with cut shad, shrimp, worms, or commercial dough or dip baits. Anglers can improve their success by "chumming" likely spots with grain that has been soaked in water for a week or two. Many anglers fish for trophy blues from December through March. Best areas are near channels and submerged brush or rock. Fish over 40 pounds are possible, and often caught on live shad. Flatheads also generally prefer live bait, but very fresh cut bait can be used. Flathead anglers should target areas with timber and brush piles along cut banks at night. Trotlining is a popular and effective method for catching all three species, and is generally more productive in the upper parts of the lake. Anglers can enjoy limited success with sunfish during April and May by fishing spawning beds in shallow coves with sandy bottoms with crickets, mealworms, or garden worms. This long river-like reservoir winds 40 miles through classic Blackland Prairie habitat and limestone bluffs. Much of the native timber is still standing and additional fish shelter has been provided by gravel shoals and rocky points. The water is generally fairly clear with a maximum depth of 108 feet. Fishing tips: Locate the bait fish and the stripers won't be very far away. Surfacing activity starts about mid-March and peaks about June. Then trolling the deep flats adjacent to the state park and the island produces limits through September. Free troll deep diving Bomber Long-A's in chrome sides with black or blue backs or downrig hair jigs with 6" twister tail trailers at about 20-25 feet. Fish will surface early mornings and late evenings during the summer months. Look for the three B's: bait, birds, and boats to locate schools of stripers. Twenty of the state's top 50 smallmouth bass have been caught from this lake, the biggest being 7.72 pounds. This is one of the only lakes in Texas with a naturally reproducing population of striped bass, however, restocking is still necessary due to low production in years when inflow from the Brazos is low. It has become one of the top trophy smallmouth bass lakes in the state. The tailrace supports excellent fishing at times for shoreline anglers. Fishing Regulations: Channel and blue catfish - 15 per day, all at least 14 inches long. All others same as state-wide. Lake Whitney State Recreation Area (254/694- 3793) is located on Farm Road 1244 thirty-five miles north of Waco and four miles southwest of Whitney in western Hill County. This 1,315-acre recreation area is on the southeast shoreline of Lake Whitney, a reservoir impounded in 1954, the year the park opened. It is in the geologic region called the Grand Prairie and is near the Eastern Cross Timbers. Adjacent to Lake Whitney State Recreation Area are the inundated ruins of Towash, an early Texas settlement commemorated by a marker in the park. Live oak, post oak, cedar, cottonwood, and hackberry trees can be found in the park, as can skunks, deer, raccoons, opossums, rabbits, armadillos, foxes, and a wide variety of birds. Park facilities include a landing strip, camping grounds, and picnic areas. Recreational activities include hiking, swimming, fishing, bird-watching, and water skiing. Lake Whitney State Park Activities include camping; hiking; mountain biking; picnicking; boating; fishing; swimming (buoyed area - no life guard on duty); scuba diving; water skiing; nature study; and excellent birding. Nearby points of interest include Cleburne, Meridian, Dinosaur Valley, and Mother Neff State Parks; The Confederate Museum; Texas Ranger Hall of Fame; and Fossil Rim Exotic Wildlife Ranch.